Live coverage begins at 8/7c. Refresh this page for updated results throughout the evening. WE START THE SHOW WITH THE BEAST! Brock Lesnar is here and the Chicago crowd is not loving him at all. Heyman goes to speak, but the crowd won’t let him talk. They start to chant “Burn It Down”! 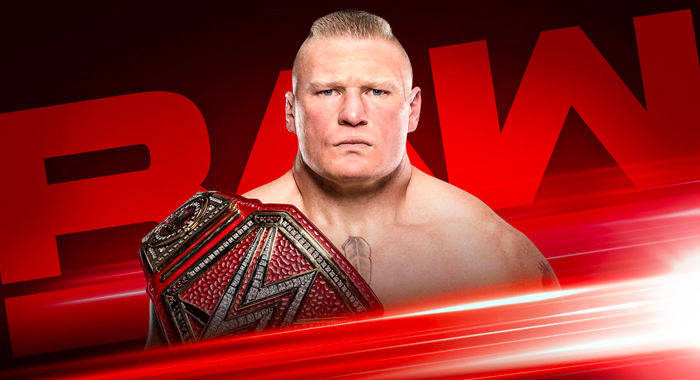 He does his schtick and presents his reigning, defending, undisputed, Universal Champion….BRRRROOOOCK….LESNAR! He says that Seth Rollins necessitated an appearance from Brock, but Rollins is a master of propaganda. He says that Brock has a problem with athletes of Seth Rollins’ size and moveset. But Seth Rollins is a fool! He asks if the winner between Brock Lesnar and AJ Styles was AJ Styles….the winner was NOT AJ Styles….it was Brock Lesnar! Brock vs. Daniel Bryan….the winner of the match…Brock Lesnar! Brock Lesnar vs. Finn Balor…..Brock Lesnar! Seth Rollins tonight has a match with Drew McIntyre and he’s a career killer and asks what Seth is thinking?! Out comes Drew McIntyre. Drew says it is refreshing to get the respect he deserves. Chicago is looking at the man who brutalized Roman Reigns and brutalized Dean Ambrose when he tried to save his fallen brother. He tells Heyman to find a new challenger for WrestleMania for Brock, because after tonight, Seth is not going to make it to WrestleMania. Out comes Rollins and he hits McIntyre with a chair! He hits him again and again and again, not relenting on McIntyre! He turns around and looks at Lesnar and Lesnar looks right back! Rollins gets in the ring with chair in hand and Lesnar gets right out and smiles right at Seth. Seth smiles back and dares Brock to get in the ring. Brock thinks about it but Heyman asks him not to. Lesnar holds his title up and walks out and Rollins stands triumphant. Finn gets on the mic and says that the luck of the Irish wasn’t on his side last week when he lost the Intercontinental Championship to Bobby Lashley. But he doesn’t plan on being the former champion for too long…. Lashley interrupts along with Lio Rush. Rush is on the mic, and he says that the leprechaun is upset because his pot of gold is around the waist of Bobby Lashley. Balor says to enjoy it while he can, because he plans on getting his title back…and his partner plans on getting HIS hands on the both of them. Braun starts the match with Bobby Lashley. Lashley steps right up and the two have a collar & elbow tie up and they’re about even. They go again and Strowman pushes Lashley aside. Lashley tags in Balor and Balor comes in and gets dropped by Lashley. Lashley gets a sleeper put on him, but Finn fights back up quickly. Balor looks to make a tag, but Lashley pushes Balor into the corner. Lashley goes into the corner and Lio Rush tags himself in. Balor dodges a hit from Rush and hits the final cut and tags in Strowman! Strowman comes in and tosses Rush from corner to corner and Rush is barely able to move! Strowman picks up Lio and Strowman is surprised by a spear from Lashley! Balor takes out Lashley and Lio finally gets up and gets to the top before hitting a frog splash on Strowman! Lio goes for the cover but Strowman kicks out with authority. Lio runs away and Strowman is pissed. Strowman looks to mow down Rush, but Lashley gets in the way and gets trampled instead. Rush is in the ring and Strowman hits him with the running powerslam to pick up the victory.